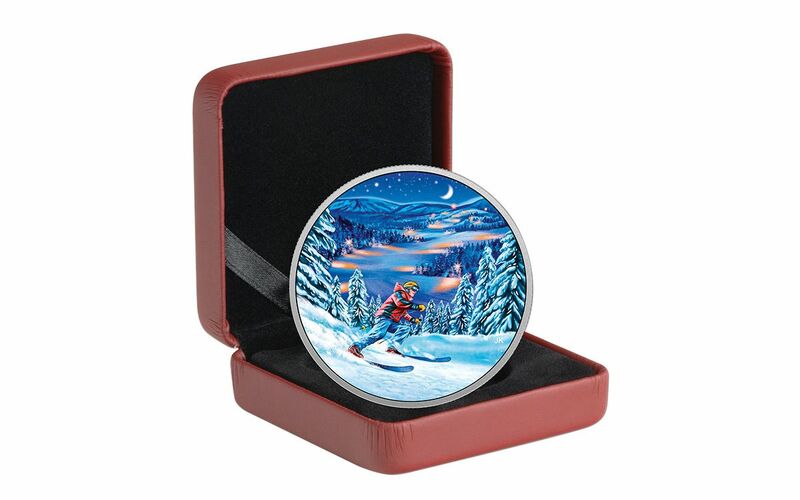 Ski the Midnight Powder with This Great Outdoors Silver Proof! For as many times as you've hit the slopes in the bright light of day, there's nothing quite like skiing down your favorite run under the chilled and serene glow of moonlight. Even though the wind may feel colder as you briskly make your way, the cool muted colors of winter seem to feel warmer under the stars. 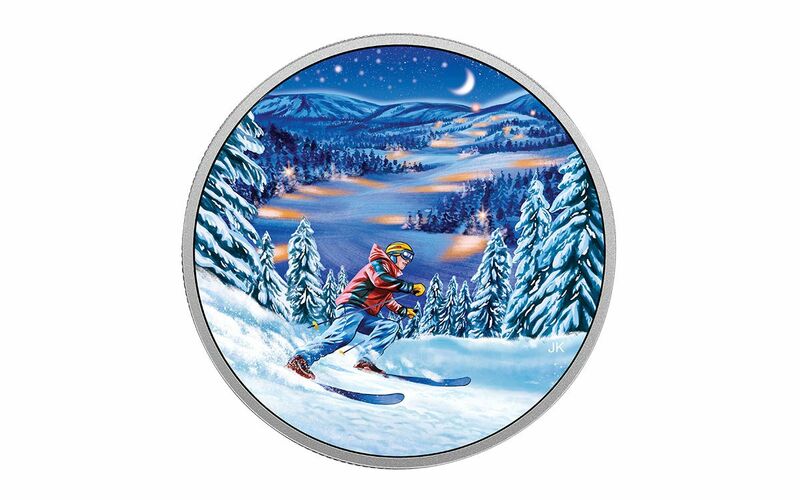 Fortunately, the Royal Canadian Mint has found the perfect way to capture the thrill of skiing beneath a quiet night sky with brilliant state-of-the-art technology. 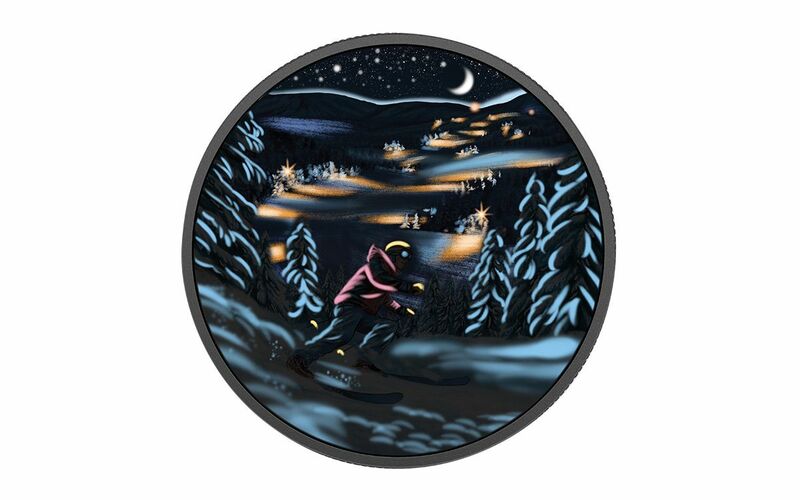 Minted in 99.99% pure silver, this 2017 Canadian Great Canadian Outdoors Night Skiing Proof begins with a foundation of crisply detailed and textured engraving. Next, a full layer of colorization brings the evening scene to life in vivid detail, given definition by the silver underneath. However, this layer of color is produced with photo-luminescent technology -- turn out the lights and the winter scene transforms into a bright, almost impressionist scene that literally glows in the dark! 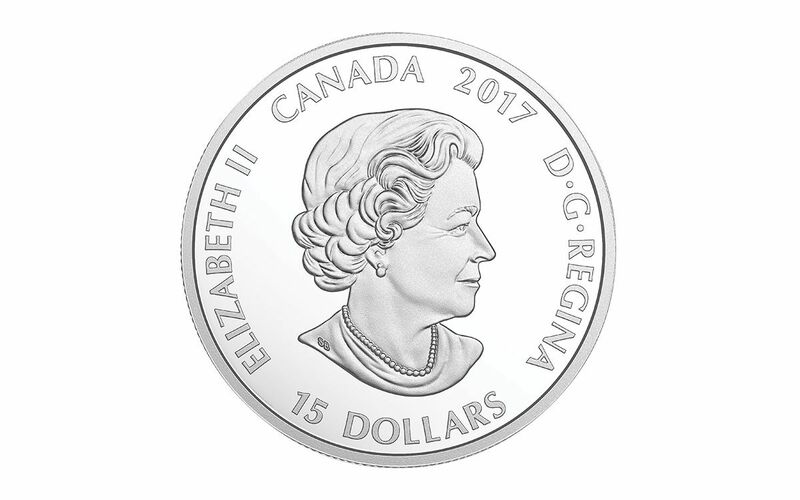 This vision from artist Joel Kimmel is on the opposite side of the legal tender 15 dollar proof's obverse, featuring Susanna Blunt's portrait of Her Majesty Queen Elizabeth II. Your proof will arrive to you encased in a protective acrylic capsule inside a maroon clamshell within a black beauty box -- all with Royal Canadian Mint branding and a numbered certificate of authenticity. The picturesque scene is a gorgeous gift for the one in your life that is constantly going downhill (and, subsequently, back uphill again)! However, with a limited mintage of 15,000, these silver proofs could disappear quickly in the night. 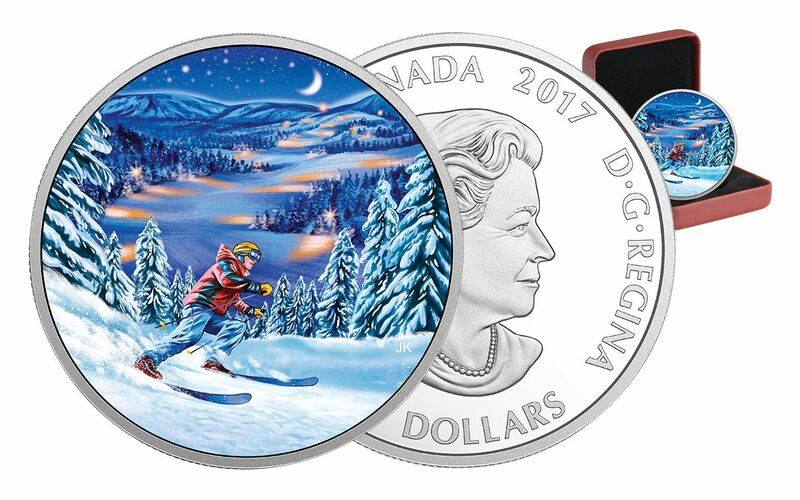 Don't delay -- get this 2017 Great Canadian Outdoors Night Skiing Silver Proof today!